I am probably the only person in the editorial world who didn’t buy into the Wellies trend. Why? They’re a bit too roomy in the foot (how many pairs of socks do you have to wear?) and uncomfortably flat. But these might be perfect. They’re a little colorful for me, but I’m trying to be more open to color. And they’re designed by Rafe, who happens to be a good friend of mine. (Check out his Rima bag for spring, inspired by yours truly). 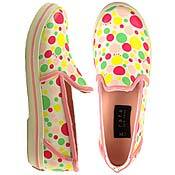 His rubber rain shoes come in three springy patterns and are really adorable.